President of Greensboro/Winston-Salem HOA Management Company Association Management Group to Speak at Summit Rotary Club | Company Newsroom of Association Management Group, Inc.
August 5, 2015	(Press Release) - Paul Mengert, President and founder of AMG, Association Management Group, one of the Carolinas' largest professional homeowners association managers with five offices in North and South Carolina, will share his experiences as a volunteer in Haiti with the Summit Rotary Club of Greensboro on Friday, August 7. Mengert serves as a board member of Rebuild Globally, a nonprofit that builds social businesses to equip and empower vulnerable citizens around the world. He uses his expertise as a business consultant to and professional manager of HOAs (homeowners/condominium associations) as well as his years of teaching professional management classes to peers via CAI (Community Associations Institute) to advise Haitian entrepreneurs creating and selling sandals made from up-cycled tires to merchandisers in the US including clothing designer Kenneth Cole. A commercial pilot, Mengert combines his passion for aviation with service. 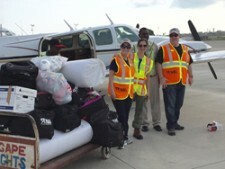 His first efforts in Haiti began with Bahamas Habitat, an international service organization that partners with volunteer pilots, aircraft owners and aviation industry professionals to fly their own aircraft to provide dignified humanitarian outreach in the form of disaster relief and basic medical, economic, housing and other aid to the people of Haiti, The Bahamas and Mexico. Mengert was part of a 2010 team to deliver disaster aid to Haiti. Since then, he's expanded his service to Haiti to include teaming up with area pilots and Wilmington, NC businesses to deliver bedding, clothes, toys and water system parts and supplies to Cap Haitien, an orphanage in Haiti that was caring for 28 children with no beds, unreliable water and electricity, no medicine and little food. Mengert and his mission co-captain Sam Schoolfield, a US Marine Corps Lieutenant Colonel, made their third flight to the orphanage this past spring. They also raised nearly $10,000 for Bahamas Habitat's disaster relief missions. "Serving in Haiti is not easy because of the politics and logistics," Mengert observes. "But I personally, and AMG as an organization, find it very rewarding to make a difference in people's lives and to empower them to realize their full potential. Whether it's Haitian entrepreneurs needing solid business advice or orphans needing a bed and a soccer ball, we like making a positive impact and helping to create a culture of opportunity and success. The more we serve, the more we want to." Greensboro's Summit Rotary Club is an organization of business and professional leaders united worldwide to provide humanitarian service, encourage high ethical standards in all vocations and help build goodwill and peace in the world. For more information about Friday's 12:30 p.m. Rotary Club meeting at Starmount Forest Country Club, visit www.summitrotary.org.